The award winning OPID electronic offender tag. "Our opportunity, as designers, is to learn how to handle the complexity, rather than shy away from it, and to realize that the big art of design is to make complicated things simple." Brightworks welcomes Josh Allsopp (right) this week to complete his work placement as one of the finalists in the 2013 Design Innovation in Plastics Award with his 'Disaster Casket' design. The Design Innovation in Plastics Award is the longest running student plastics design award in Europe and the brief for this years competition was titled "Saving Lives - Design for Disaster Relief". 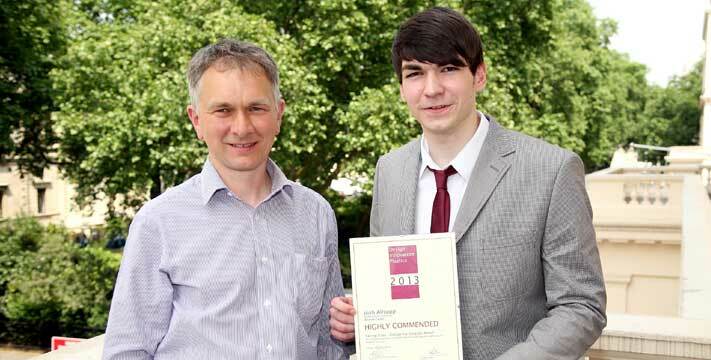 Josh received the Highly Commended Award for his project 'The Disaster Casket' as well as a placement at Brightworks Ltd.
Josh said; "instead of going down the traditional routes of water purification, temporary shelters, food packs etc. I decided to tackle a more taboo problem; dealing with the deceased. I have always had a desire to design and make things and it is this desire which has fuelled my ambition to become an industrial designer. I hold enthusiasm for the design process as a whole and I am constantly trying to build and develop my skill set to improve every aspect of my design work." Josh is currently in his third year studying Industrial Design at Northumbria University and is seeking further placement opportunities from March 2014 - September 2014. The AnimAlarm product, designed by Brightworks, wins Aspire Magazine's Innovative Product of the Year Award 2013. The team at Aspire magazine were so impressed with the AnimAlarm, believing that every dog owner should have one, that they have awarded the AnimAlarm with a certificate of recognition for Innovative Product of the Year 2013. On receiving the award Victoria Davidson of Animaware said "This is fantastic. I am honoured that the AnimAlarm has been recognised. I knew that it could benefit many people, but I never realised how high customer demand would be". Aspire Magazine is an expanding publication that has been developed to offer the people of the East Midlands an exclusive and inspirational read that will reflect their values and leisure interests. Design students from Northumbria University, Loughborough University and the Royal College of Art, have made it into the finals of the prestigious Design Innovation in Plastics Awards 2013, out of a record number of students who registered for the competition. For the last four years Brightworks has been a major sponsor of the annual competition, which is supported by market leaders in the fields of design and innovation. The competition was established in 1985 and is now the longest running student plastics design award in Europe. The 2013 brief challenged students to 'Save Lives', by designing a product that would help to alleviate the suffering of disaster victims. The threat of disaster, be it natural or man-made, is an ever-present concern to us all, whether flood, earthquake, act of war or terrorism. Martin Sixsmith, chairman of Design Innovation in Plastics, commented: "We need to be innovative and look at new ways to tackle any disaster, and this competition has been the perfect platform for design students across the UK and Ireland to be creative and design a product that could help make a big difference". The competition winners will be announced at the Awards Ceremony to be held at the Institute of Materials, Minerals and Mining (IOM3), in London, on Friday 5 July 2013. After months of work and deliberation, Brightworks' new brand identity and website go live online. Our brand colour scheme has been updated to reflect the medical and healthcare work that has now become a major part of our business. The old green colour has now been replaced with a softer, more muted purple colour. The new website is also more up to date looking and contains much more information than before. The new layout has been carefully considered; to retain a simple feel, to allow quick navigation and to provide a logical location for the wide variety of information it contains. We welcome your comments and feedback; either by getting in touch directly or by using our social media buttons (at the bottom or every page). Brightworks' design studio building, Indigo House, has been brought by new owners; part of the Vencida Group of companies. Brightworks will continue to occupy the same space and business should be unaffected by the change. However the new owners plan to change the building name from "Indigo House" to 'Stanley House'. The name change will likely take effect early in 2013, although Indigo House should still be recognised by postal and other delivery services for several months to come. Brightworks' client Ecoegg has been chosen, from a shortlist of five companies, as the overall winner of the Smarta 100 Special Award for Innovation 2012. The announcement was made on 8 November during the awards ceremony at the O2 Arena in London. According to the Smarta 100 website, this is historically one of the toughest categories for the judges to decide on as, by nature, every business in the Smarta 100 will have created a little niche for itself through terrific innovation. The shortlist consistently think outside the box, coming up with innovative ways to improve our lives and expand their business in new ways. The overall winner will have to stand head and shoulders above the others by proving it is the most disruptive in its sector, the most entrepreneurially-run company, the most promising business or the small business making the greatest improvements to its customers' lives in some way. Click here to go to this project case study page in our product design portfolio. The Birthing Baby has been announced as the winner of the Horners Awards for Plastics Design and Innovation 2012. This prestigious award is run jointly with the BPF and the Worshipful Company Of Horners, and is awarded for innovation in plastics design and manufacture or in the processing of plastics. The prestigious award is believed to be the longest established Design Award for Plastics in the world. It is a cornerstone of the Horners many activities supporting Design and Education in the Plastics Industry. The first competition was held in 1947, attracting some 14 entries. Since that point the award has gone from strength to strength. The Plastics Industry Awards reward excellence in materials usage, design and manufacturing as well as training and environmental performance. The birthing baby was highly commended within the Industrial Product Design category, but narrowly lost out to the F-Board - a 100% recycled PVC scaffolding board. The birthing baby is an obstetric training manikin, designed to improve the training of doctors, midwives and nurses to prevent adverse outcomes in childbirth. The head, body and limbs are made from RTV Silicone rubber, ABS and water blown polyurethane foam. It includes several realistic, key anatomical features. The head is suitable to practice forceps and suction deliveries and the arms, legs and head articulate realistically. The flexibility, hardness, density and weight distribution of the skin, limbs and joints closely replicate those of a real baby. Brightworks have recruited a new Product Design Engineer to their design team. Matt Farmer, has a first class Product Design degree from Bournemouth University and several years experience; previously working at Dyson, as part of their new product development team, and prior to that at Innovate product design consultancy in Salisbury. Matt brings with him a wealth of knowledge in plastic design, product engineering and design for manufacture. The Plastics Industry Awards reward excellence in materials usage, design and manufacturing as well as ergonomics and environmental performance. The breast pump was highly commended within the Consumer Product Design category. The Lansinoh Affinity® Double Electric Breast Pump is easy to use, inexpensive and gentle on the skin. It features ComfortFit™ Breast Flanges for a soft secure fit and Custom Expression™ Technology for maximum milk flow. The Affinity® is one of the most advanced and affordable breast pumps available. Glide - Pharma won the Best Business Award at the 2007 Medical Futures Innovation Awards, with the Solid Dose Injector at the core of the business. The Awards are widely regarded as the healthcare industry's Oscars and this year's competition attracted over 500 entries. The Plastics Industry Awards reward excellence in materials usage, design and manufacturing as well as training and environmental performance. With the judges being impressed with the innovate design of the product, the OPID offender tag won the Industrial Product Design category. Electronic Monitoring has in recent years become a way for the criminal justice system to provide an alternative to custody in prison. It means offenders are monitored whilst carrying out community sentences, on bail pending a court hearing, or who have been released from prison and are therefore subject to special conditions.